They start talking about mobility training, and how Joe packs that ball in his suitcase everywhere he travels. His guest is Alberto Gallazzi, a trainer for the Circular Strength Training system developed by Scott Sonnon. Gallazzi has trained military soldiers and gradually gotten them to accept more mobility work alongside the strength and conditioning training. I never heard of it and had to look it up. It’s the MobilityWOD Supernova 2.0 120mm. 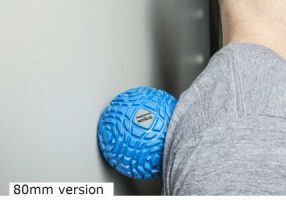 The whole thing is about getting the knots out of your back and other tight spots so you can be pain-free and have full range of motion and put full effort into whatever you’re doing, whether it’s sports or working out or everyday tasks, without having to move around trouble spots in your body. I’ve been using tennis balls on my hips and spine, but for my back mostly a black foam roller (that’s the exact one I bought, but they’re probably all the same), the generic type that you can find a hundred brands of (the black ones are all high-density, all virtually the same…but I like the 36″ so it fully covers my back and shoulders and I don’t roll off). Several rolls on that and I get some good pops in my spine. And I have a Body Back Buddy for digging into specific spots. My upper back is always bugging me. Other people use lacrosse balls. Joe mentions those and says this is a little better than a lacrosse ball. Like with rollers, there’s a variety of massage balls with spikes or bumpy surfaces. This particular one is sold only by Rogue as of writing. They make a big deal about how this design with its particular surface creates the best “shear” pressure to pull your stuck tissues apart. I don’t know, that’s what they say. I’m going to give it a try soon. The Body Back Buddy I have seems like it should work better than it does. It feels like it works, really hits those spots, but maybe the problem is it has a smooth surface and doesn’t really pull the tissues apart, just presses down on them. And sometimes I find I just can’t get the right angles. A good massage I find actually is more effective, getting the blood flow in there and just moving things around in different directions to loosen it up, even without deep pressure. Rogue also made a smaller 80mm version that would obviously be more travel friendly and I have to think would dig into your tissues better, but Joe’s got the 120mm for some reason. They both get great reviews, about the same number too. About a year ago I was thinking about giving the Rumble Roller or Grid 2.0 a try but never did. It’s hard to tell how many of these are gimmicks with good marketing. Sometimes even people who own it are excited and biased towards the newest greatest thing, even if in reality there’s something better out there. 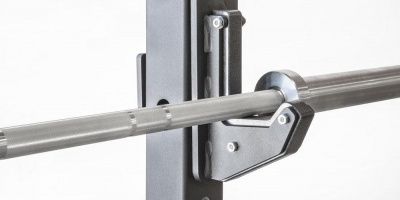 What’s your favorite myofascial / trigger point therapy tool?